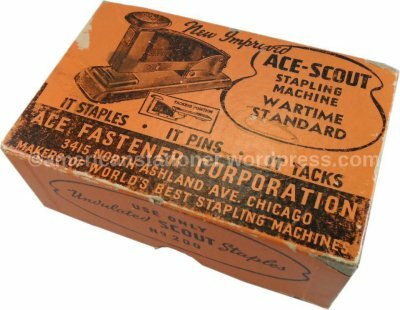 The Ace Fastener Company has been manufacturing stapling machines since the 1930’s. In its history the company has released approximately 20 different stapler models. However, about half those models are simply modified versions of the other half (such as the long-reach version of the Pilot or the Heavy Duty Ace Clipper). 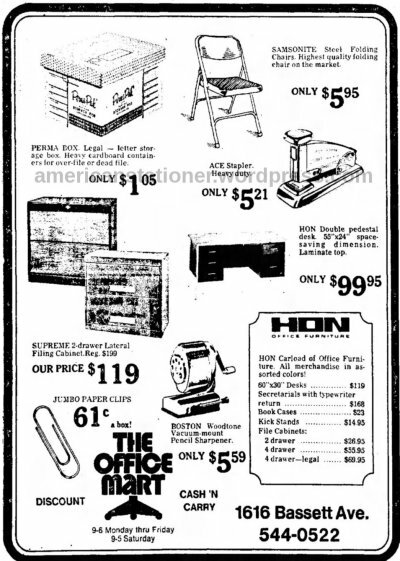 Also, the office/home use staplers that are still available today from Ace Fastener are the same designs that were released back in the 1930’s and 40’s with almost no changes of any kind. This is an incredible testament to enduring design and their high-quality instruments that have kept them in business for so long. 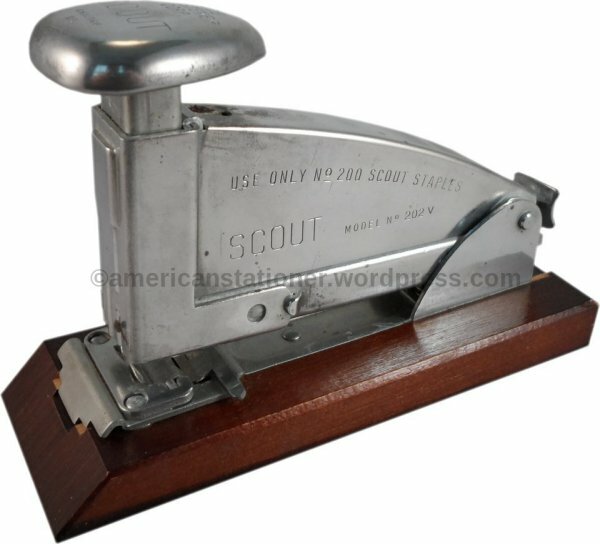 One of the earliest introduced models, although one that is no longer being manufactured, is the Ace Scout Model 202 stapling machine. 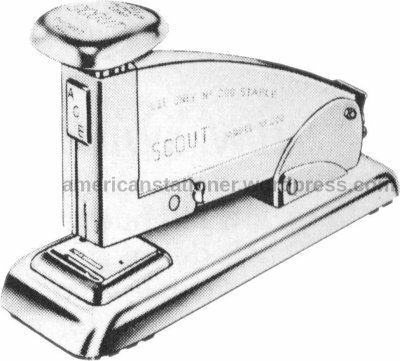 The Scout was their smaller standard office-use stapler model. There were two basic versions of this model during its run (see note 1). The first version model 202 was introduced in 1938 and was available until at least 1940. It weighs 12 ounces and measures 4.6875″ L x 1.875″ W x 3.125″ H. It was constructed of chrome-plated steel and is easily identified by its concave backplate. The second version model 202 was a redesign of the original model 202 and featured a convex backplate. It weighs 10 ounces and measures 4.9375″ L x 1.9375″ W x 3.125″ H. It was constructed of steel and aluminum. In the following picture the aluminum parts can be easily identified by their red color (base and backplate). Note that this model is slightly larger and lighter than the previous version. It was introduced in 1941 and was available at least until 1975. While originally only available in chrome, by about 1960 you could purchase these in chrome, copper, red, blue, and green. Dating a second version model 202 can be difficult. One clue is to look on the front plate just under the plunger. If the word ACE is imprinted in the square then it was made around 1964 (see above illustration). This is the earliest year I have found of the imprint on the Scout. I’m unsure how long the word ACE was imprinted (it was dramatically different for every model for some unknown reason) but my opinion would be that it was until it was no longer being sold in 1975. 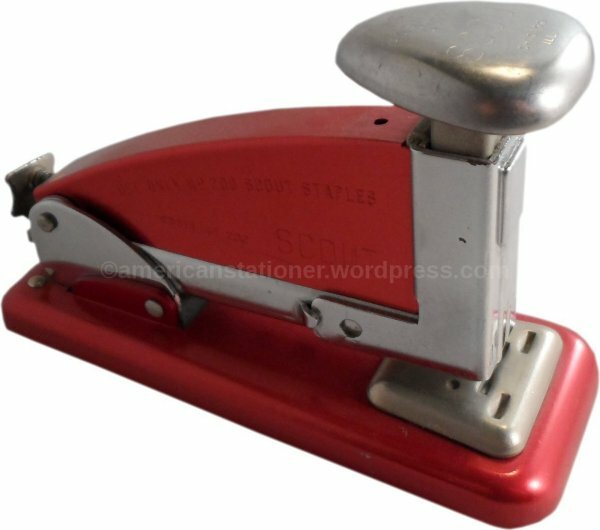 If the stapler is not imprinted in this way it is likely to be manufactured pre-1964. If it is not imprinted but it is in a color other than chrome it will have been available from approximately 1960-1964. 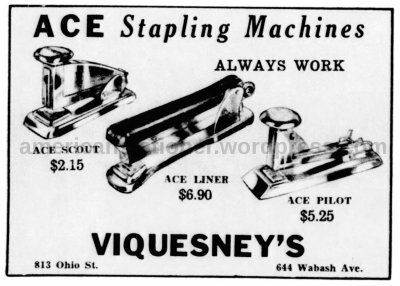 Also, from approximately 1943 to 1946 the Ace Fastener Company produced what they called victory staplers. These were their regular models (402, 404, 102, 202) but with the base made of wood and all steel parts (no aluminum, chromium, or other rationed metals). You’ll also see these referred to as the “Wartime Standard” models. These models had the “V” designation after their model number imprinted on the stapler. Above is an Ace Scout model 202V made during this time. 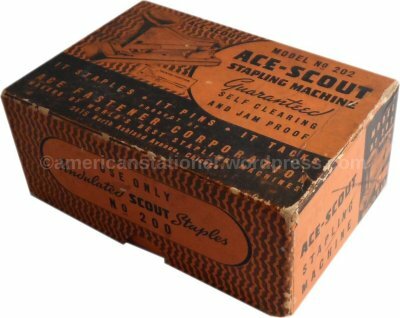 staples for the Ace Scout model 202, first version. Note the picture on the top left of the box. The box for the second version is identical except the picture of the stapler in the upper left corner was updated to the second version model. The two men to be credited for these patents are William F. Weber and William G. Pankonin. I have not been able to find much information on these men but I do know that William Weber died of a heart attack on June 29, 1942 in Evanston, Illinois. These staplers are tough as nails and if you find one it is likely to work as well now as on the day it came off the assembly line. 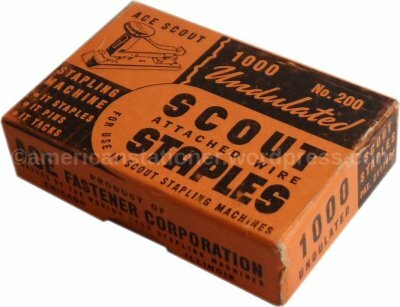 Be aware though that the Ace Scout 202 does not use standard staples although they will fit just fine in the staple carrier. You must use the specially designed undulated staples. 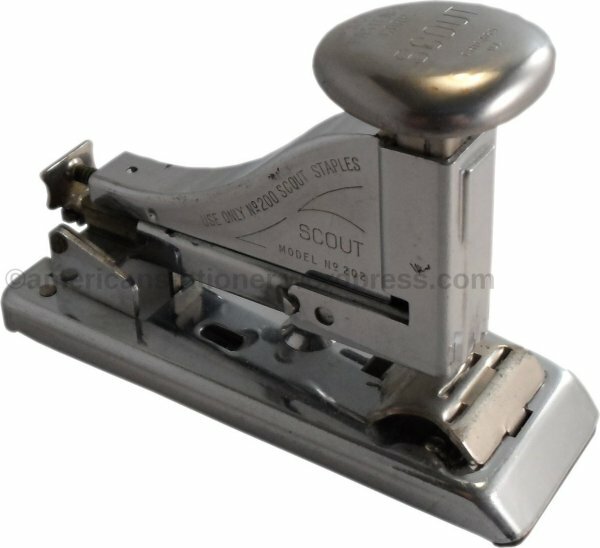 One of the most common issues found with Scouts is their being jammed by someone who tried to use it with standard staples. I have about a 60% success rate in unjamming Scouts messed-up in this way. 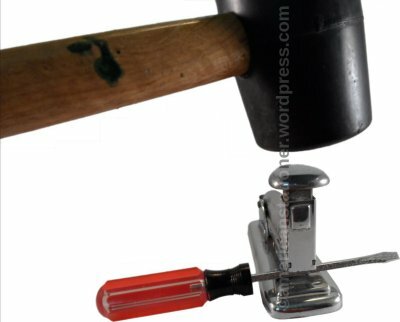 If you are unaware, the way to unjam a Scout (or any stapler) is to first remove as many staples as possible from the carrier, then place some kind of solid bar (a screwdriver works well for this) between the carrier and the base and then, using a rubber mallet, hit the plunger very hard. This usually will free up a badly-jammed stapler by forcing out the jammed staple. When I’ve tried to unjam Scouts in the past I’ve been successful with three and ended up destroying two. That is how badly you can mess-up a stapler by using the wrong staples. 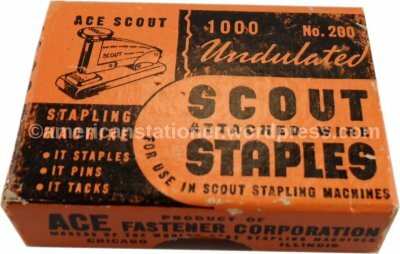 The Ace Scout uses special undulated staples which are still made today and are easily available on the internet on sites such as ones named after South American rivers. 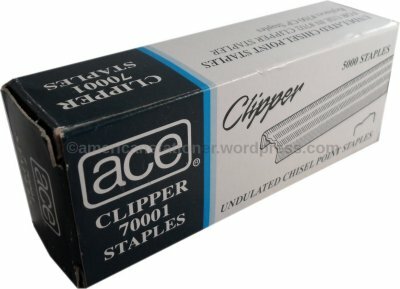 You need to look for Ace Clipper 70001 undulated staples. I’ve seen at least two web sites state that there are three models of the Ace Scout. This is not accurate. This “third model” is simply either a first or second version 202 that is missing the protective back plate. All Scouts produced had either a concave or convex backplate.